Soak the white beans in water overnight. Place the hambone in a large soup pot with about 6-8 cups of water (enough to cover the bone), the bay leaf, and some pepper. Bring to a boil over medium heat, cover, and let simmer until the meat is falling off the bone, about 3 hours. Remove the ham bone and set in on a cutting board to cool. Skim any foam/scum off the broth as needed. Drain the white beans and add them to the soup pot along with the onion. Cover and continue to simmer until the beans are soft and creamy, about 1 hour. When the ham bone has cooled enough to handle, remove the meat and shred/dice into bite-sized pieces, removing any fat, etc. Get off as much meat as you are able. Return the meat to the pot. Season with salt and pepper as needed (the broth will be salty from the ham). In a bowl, whisk together the flour with a good pinch of salt. Stir in the egg and then add milk 1 tablespoon at a time, stirring after each addition, until the dough comes together. Bring the soup back up to a low boil. Use two teaspoons to scoop up the dough into about 1-1/2 inch long pieces that are about 1/2-inch wide (these are approximate and very rustic). Drop them one at a time into the soup and continue until all the dough is used. Give it a good stir and put the cover back in the pot. Let cook until the rivels float and are cooked through, about 1-2 minutes. Remove the bay leaf and serve garnished with the parsley. Great soup full of flavor and perfect for these cold days. BTW your cookies sound great, I always drain of the bacon fat when I cook bacon and use it later for cooking or baking. I needed this recipe last week. We had baked a huge ham and had leftovers in one way or another all week. This sounds good. I wish I could have a bowl now. It looks hearty and so flavourful. This will be a good soup for when I have ham leftovers. Looks delicious! 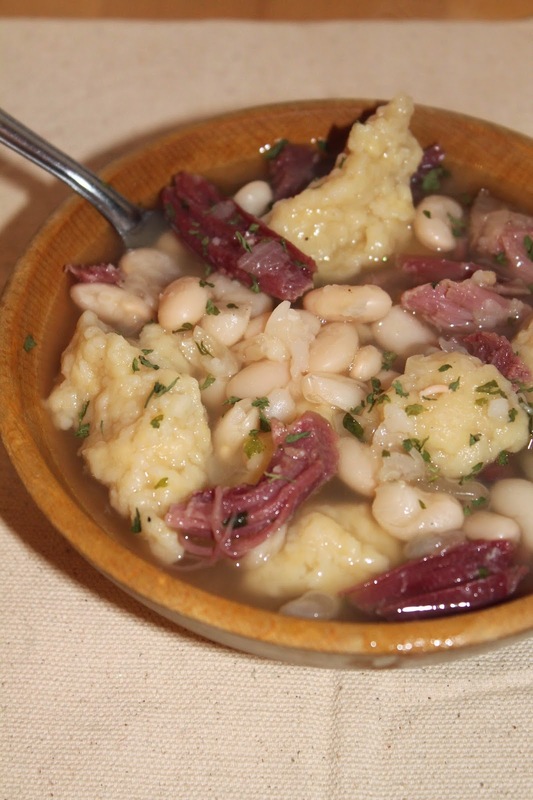 Dear Amy, I have to admit I had to look up the word "rivel", here is what I found "a very small dumpling made of a batter of butter, egg, flour, and seasoning, cooked in broth" - always love to learn something new - thank you for a wonderful recipe - this soup sounds wonderful! You always post fabulous, comfort-style, family-friendly recipes! I'm glad to know about rivel--sound delish to me! Such nice chunks of ham--looks like a delicious bowl of comfort!! What a delicious and comforting looking bowlful! Rivels are good! Haven't had one in years, though. 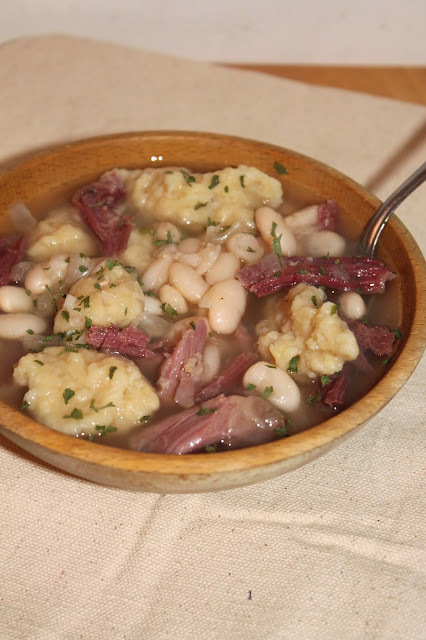 This is a great soup -- perfect for the really cold weather we're experiencing. Thanks. First time to hear of rivel - but it sounds yummy! Willing to try this soup ASAP! I've never had a rivel or even HEARD of them! I love your recipes and I'm always glad to see them on the Friday Frenzy! Pinned! This is comfort food at its best straight from my childhood!!! This sounds like a delicious, hearty soup! Thanks for linking up on the #Celebrate365 Soup Swap!